Donté Bonner and Remy Zakin in One Flea Spare. Photo by Monica Simoes. 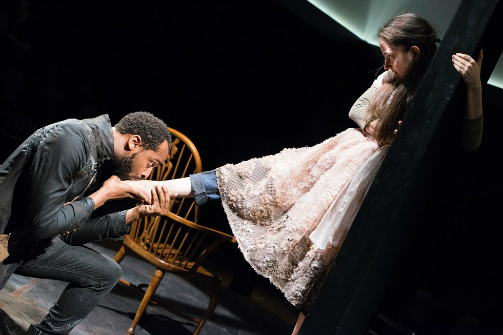 BOTTOM LINE: A dark, macabre revival of the award-winning play, this production will chill you with its bleak perspective and move you with its unexpected intimacy. One Flea Spare is set in London during the outbreak of the Bubonic plague of 1665-1666, which brought the deaths of nearly a quarter on the city’s population, created mass panic, and caused an exodus of wealthy families from the city. Mr. William Snelgrave (a commanding Gordon Joseph Weiss) and Mrs. Darcy Snelgrave (Concetta Tomei), an aristocratic older couple, remain quarantined in the heart of the city and trapped in the two rooms of their stately home where no one has yet died. Patrolled by a clownish and cynical guard named Kabe (Donté Bonner), responsible for keeping everyone inside, the Snelgraves find themselves joined by two unexpected guests, a mysterious girl named Morse (Remy Zakin) and a melancholic sailor named Bunce (Joseph W. Rodriguez). Contained within the claustrophobic space of their confinement, the Snelgraves and their guests exist in an unexpected and uncomfortable intimacy, and social barriers falter. We are introduced to the plague early via Morse’s opening exposition, a desperate monologue about the spreading sickness, performed with great intensity that works to immediately set the atmospheric, feral tone of the show. It is revealed, however, that the plague is more than simply a bodily threat: spreading through intimacy and touch, the plague is a metaphor for the impulse to destroy. The plague is the chaos of humanity, catalyzing our most extreme behaviors. As such, Naomi Wallace’s powerful script meditates on class systems and the relationship of status and power. Winner of a 1997 OBIE Award for Best Play among a number of other awards, the script surges with both beautifully poetic monologues and starkly blunt observations about death. Director Caitlin McLeod creates gripping scenes, smartly playing with levels of physicality in order to emphasize the games of power that the characters engage in together. Bunce’s strength and virility are contrasted with Mr. Snelgrave’s silken suit and shined shoes, the trappings of his wealth and social status. In one particular scene, Mr. Snelgrave and Bunce play with the perversity of upending the social order; Bunce is allowed to try on his master’s shoes and carry his threatening cane, while Mr. Snelgrave is left barefoot and subservient. Realizing quickly that they have come too close to the third rail of social inversion, they quickly switch back, though not before it becomes painfully clear how artificial their divide truly is. McLeod should be commended for her strong use of the stage, developing thoughtful and consistent patterns of movement to communicate place in the featureless room. Scenic designer Bryce Cutler has created a compelling performance space within the Sheen Center’s new black box theater, featuring a dirt-encircled raised platform that always seems in danger of being crushed by the weight of four black walls. With lovely, atmospheric lighting design by Aaron Porter, the space feels small despite the fact that it has no enclosure. It is a bit of a shame, however, that they do not make use of the theater’s impressive catwalk. Sarafina Bush’s costume design evokes historical accuracy interpreted through a post-apocalyptic lens; Mrs. Snodgrass’ shiny blue dress is perfectly aristocratic yet also futuristic. Mark Van Hare’s original atonal string compositions add great depth to the transitional moments of the show, and similarly transport us beyond the historical context of seventeenth-century England. The poetic language of the show invites a kind of performativity from its actors that heightens dramatic tension; as such, the cast tends to make piercing, declaratory choices for important moments. However, they also find clever smaller moments to imbue their somewhat archetypal characters with humanity. Remy Zakin’s Morse is at her best when she finds ways to be playful, fearless and defiant. Concetta Tomei initially presents a stately Mrs. Snelgrave, ultimately exposing emotional intimacy along with physical truths. With great relish and cynicism, Donté Bonner plays Kabe with striking callousness, making it easy to hate his selfish authority. All the characters carry hidden wounds, exposing their tender vulnerabilities as their fates become inextricably entwined. One Flea Spare makes painfully clear how closely sexual intimacy and death walk hand in hand. The characters long to be touched and to be held, yet also give into violence and the cruel impact of power. They are each other’s salvation and destruction. One Flea Spare is by Naomi Wallace. Directed by Caitlin McLeod. Scenic and Projection Design by Bryce Cutler. Lighting Design is by Aaron Porter. Music Composition and Sound Design is by Mark Van Hare. Costume Design is by Sarafina Bush. Property Master is by Megan O'Leary. Production Manager and Technical Director is Matthew Mauer. Creative Producer is Allison Bressi. Production Stage Manager is Ed Herman. The cast is Donté Bonner, Joseph W. Rodriguez, Concetta Tomei, Gordon Joseph Weiss, and Remy Zaken.